‘Grin and Bear it’ was the second of six cartoons featuring the nervous bear Humphrey, Disney’s last cartoon star to hit the cinema screen. 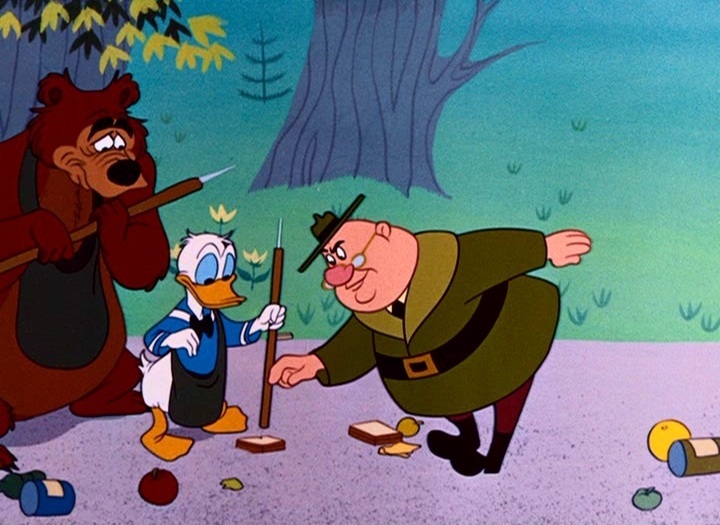 It also introduces the fidgety park ranger, voiced by Bill Thompson (more commonly known as the voice of Droopy and Mr. Smee in ‘Peter Pan’, 1953). The park ranger would star in five cartoons. In this short he orders the bears to mix with the tourists, something they gladly do, because this means getting fed. Humphrey, however, is stuck to Donald, who doesn’t share a crumb with the bear. This leads to Humphrey making more and more desperate attempts to obtain food. Donald is hardly anything more than a straight man in this short. But it’s an entertaining film, nonetheless, featuring beautiful backgrounds.